Chicago has an amazing public works of art collection and one of my favorites is Flamingo by Alexander Calder. My flamingo interest goes way back. 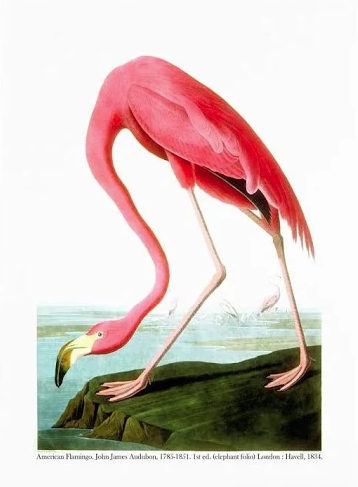 I love those unique pink birds that are superbly represented in the famous Audubon prints. Let's see how this print compares to Calder's abstract sculpture. Calder has taken artistic license with the color for his amazing bird. Instead of a flamingo pink, he did it in more of a orangish red which has since become known as "Calder red". It is almost as though he has two necks to his flamingo but you can see the similarities between the two representations. Little me is in my fit and flare wool gaberdine jacket with bike shorts that were just shown on the Chanel runway in Paris yesterday. Let's be clear, mine are Lululemon. The Chanel ones won't even be ready for purchase until Spring of 2019. My modern bike short look goes pretty well with a Calder's ultra modern sculpture that was actually done in 1974.